Never pass up an opportunity for potty humor. In our Ten Killer Tips for iOS 6 feature, we showed you how easy it is to reply to a phone caller with a text message in iOS 6. When the call comes in, tap on the little phone icon in the lower right and slide up. 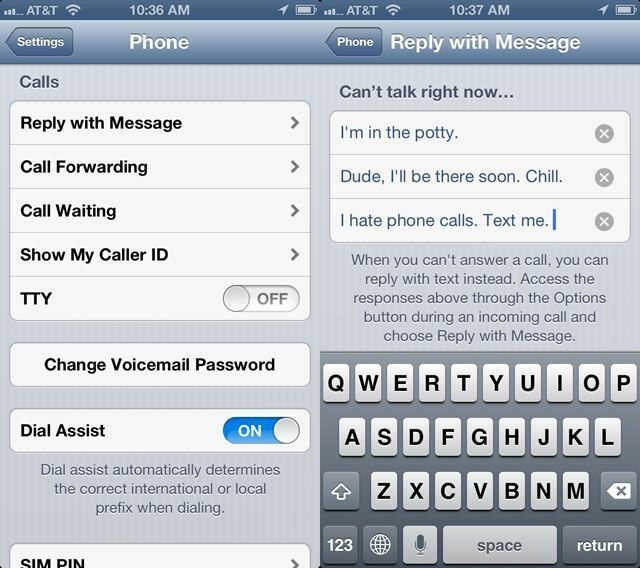 You’ll get the option to either reply with a message or have your iPhone remind you to call the person back later. If you choose to reply with a text message, you get a couple of built in replies–Call you later, I’m on my way, What’s up–or you can type a custom message. Ever wanted to change those pre-written messages? I know I have. Here’s how. Launch your Settings app, and find and tap on the Phone settings button. Then tap on Reply with Message. You’ll then be able to type in any serious or humorous messages into the three slots there for your use. You’ll still be able to type your own custom message, too. Interestingly, the typical auto capitalization doesn’t seem to apply here, so maybe the developers wanted you to work at using proper English. Whatever the case, this is a great way to personalize the way you interact with people when you tell them that you can’t answer the phone right now.